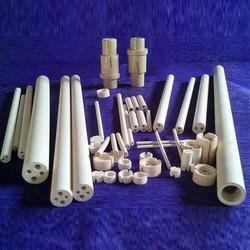 We manufacture Ceramic (Magnesia based) multi hole tubes for Medium Density Cartridge Heaters and Magnesia (Mg 70 to 95%) Cores for High Density Cartridge Heaters.Our standard sizes range from 3mm dia upto 18mm dia in 2, 4 and 6 hole configuration and lengths starting from 50mm upto 300mm. Ceramic cores are primarily used in investment casting and because of its high refractoriness and shock bearing ability. These ceramic cores are manufactured by our chinese partners, M/S. Filtech precision ceramics. They can be easily removed after casting by leaching. The product is ued in controllable aural various heat treatment furnace to avoid the contact of elding burning outcome or to avoid the corrosion of furnace gas to heating element. The process(the conversion of elding burning or electric energy) is put into refractory steel tube and let amount of heat radiate by wall of tube. This device is called as heater tube. 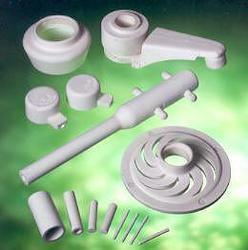 We cater to our clients wide range of Ceramic Core, which is perfect combination of efficiency and cost effectiveness. Our clients can also avail from us customized solution to our vast product line on the basis of specifications given by them. Yogdeep offer ceramic core for airtex. These are widely applicable in various power generation, automobile, transmission and other related industries for producing intricate internal shapes in investment castings. Apart from these, we also design, these ceramic cores for critical internal shapes in closed impeller and valve castings. - Ceramic cores suitable for casting by Equiax, Directional Solidification and Single Crystal processes. - Nickel, chrome & cobalt based, stainless steels, high temperature, aluminium. - Exceptionally stable core bodies with very high tolerance. Ceram Tec India Pvt. Ltd.
We also provide our clients with Ceramic Core For Airtex. These are widely applicable in various power generation, automobile, transmission and other related industries for producing intricate internal shapes in Investment Castings. Apart from these, we also design, these ceramic cores for critical internal shapes in closed impeller and valve castings. Dimensional checks: visual surface finish inspection under magnification weight evaluation of Alumina, Sodium and Potassium oxide contents at Central Glass Ceramic Research Institute, Kolkatta.